Relola combines smart home searches with consumer-focused social curation of market information. Advocates for open sharing of market data among agents. Embraces exceptional visuals and user-engagement tactics. 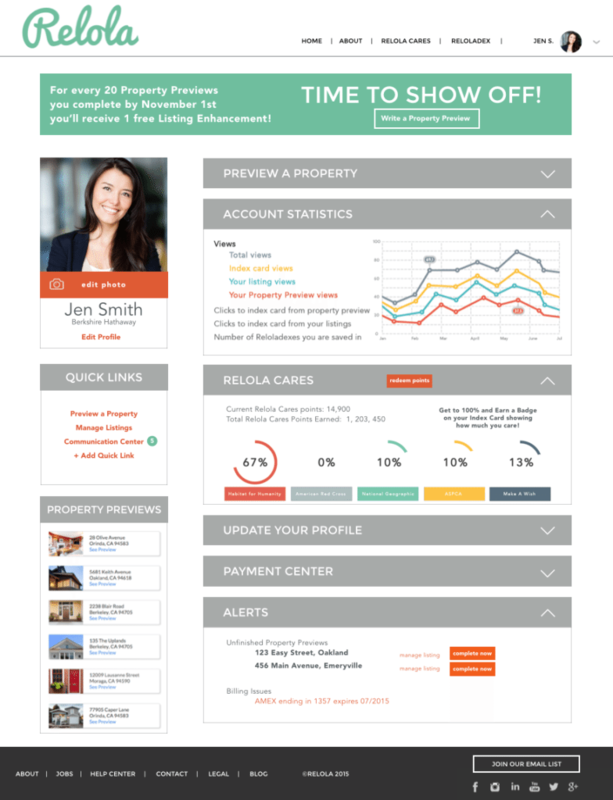 Relola is a Web platform for agents to market properties and openly share market insight with buyers and sellers. Ideal for: Agents looking to leverage social engagement as a selling tool and want a marketing alternative to Zillow and realtor.com. Always open: Relola opens up the market to consumers while ensuring the value of agents to the transaction. Shop talk: Agents share input, create content around other market listings. 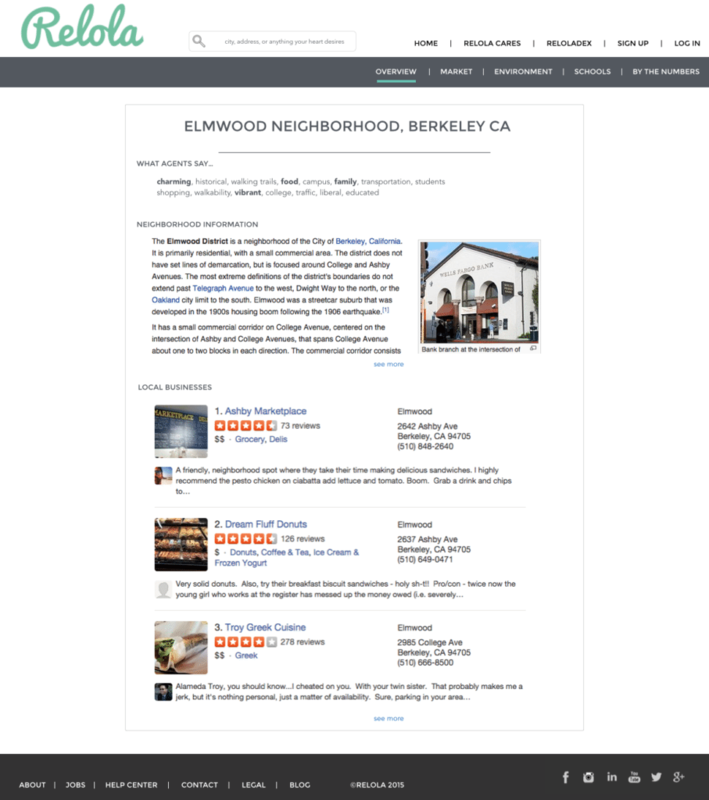 Curation is king: Relola cleanly collects, presents community information in context of individual listings. Relola offers online home shoppers a visually engaging, highly detailed and, best of all, ad-free property search experience. Agents will be happy to know that on Relola, your listing is your listing. Compelling, photo-rich property marketing pages are not saddled with reminders of how big competitors’ marketing budgets are, nor do they erode marketing expertise by juxtaposing it with nonsensical home valuations. Instead, Relola helps agents sell homes by deftly embracing the concept of market transparency. This compelling listing and agent marketing platform willingly shares with buyers the community, demographic and sales intelligence so coveted by the industry. 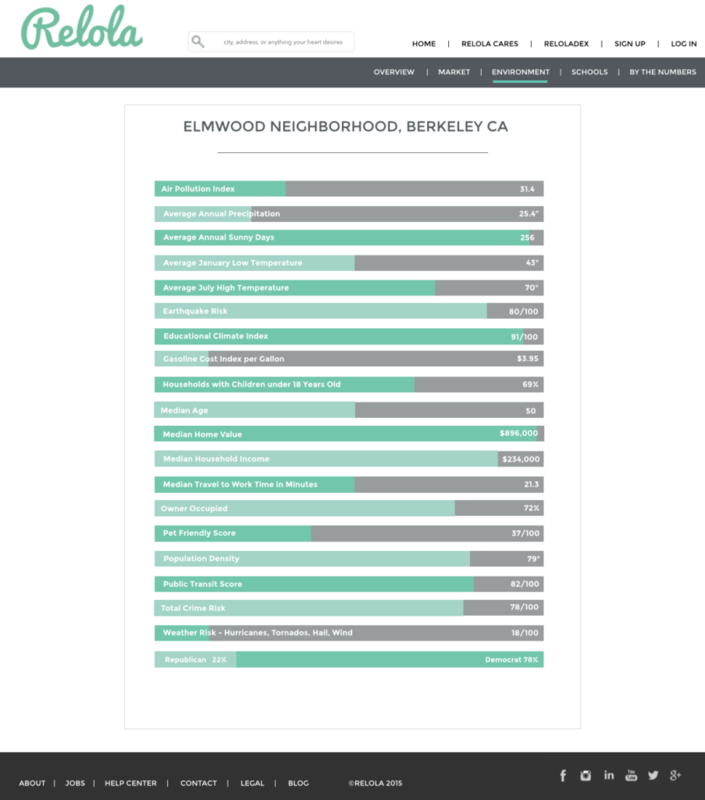 When searching for properties, consumers interact with an array of vivid, shareworthy neighborhood data presentations that relate to each search result. Critical buying data isn’t hidden behind email capture forms or landing page demands. While capturing this information isn’t groundbreaking stuff, integrating it openly into the context of property search is indeed a differentiator. Relola’s visual themes encourage interaction with the information. The company intelligently crafts its approach as pro-consumer and pro-agent. It does not promote a discount model nor will it allow FSBOs. 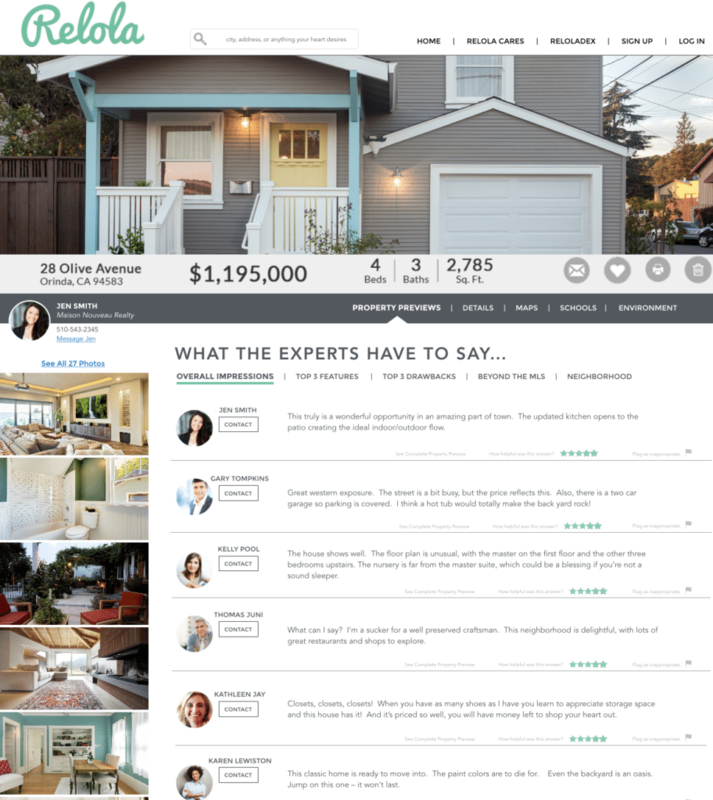 Agents leverage their own custom URL on Relola to share listings, homes sold, homes previewed, preferred contractors, videos and, soon, 10-second video business cards. Every property is characterized by its Top 3 Features and Top 3 Drawbacks. Showing agents who offer drawbacks are asked to offer solutions — also made public. A listing page will also include pictures taken by showing agents. The Reloladex is how buyers and sellers search for agents or contractors. Agents are ranked based on the previews and social reputation built on the site. Since comments and listing views are genuinely sourced, not purchased, buyers can be more confident in their choice. Consumers can select an agent based on his or her Relola Cares status, a points-based ranking generated by site activity. Rankings earned result in donations by Relola to an agent’s chosen nonprofit. Relola is trusting agents to work as a social network, a share-ready, honest group of colleagues unafraid of what buyers know about a property. Stop calling it “cozy.” It’s small. It’s not “a handyman’s delight”; the place needs a roof. The platform encourages local agents to have back-office discussions on the front porches of their listings, all within earshot of the Internet. This is clearly a direct result of how online communication and crowdsourcing has changed business. Why is anyone surprised at the rise of hybrid brokerages given the marketing death race companies have been conducting on the major listing portals? Customers are left unserved, coughing in the contrail of local competition. Zillow and realtor.com showed the industry how to wield its own data, ultimately something only the industry cares about. Relola is wielding market data in ways consumers will care about. And that’s what agents should care about. Relola enters public beta mode at Inman Connect, expecting to officially launch in early 2016. Do you plan to use Relola — and what do you think? Leave a comment and let us know!